U.S. Rep.Joe Kennedy III embraces Democratic Senate candidate Beto O'Rourke during a campaign rally at the McAllen Convention Center on Saturday ,Oct. 13, 2018, in McAllen. McALLEN — Before Beto O’Rourke sharpened his critique of Ted Cruz at the least-intimate rally he has held in the Rio Grande Valley, a nurse handed the Democratic U.S. Senate candidate a light saber. The man also handed O’Rourke a bag of pan dulce, or sweet bread, for O’Rourke to give to his campaign comrade this weekend, U.S. Rep. Joe Kennedy III, D-Mass. That’s how O’Rourke, the representative from El Paso running to unseat U.S. Sen. Cruz, led his speech in front of more than 1,500 people at the convention center, the most spacious and best-air conditioned venue O’Rourke has held court in during his more than seven visits to the Valley over the last two years, with another slated for Thursday. “I remember being at Sofie’s (Saloon) in March of ‘17, I was like 30 feet from Beto, there was like 100, 150 people,” said supporter Ian Llewellyn. On Saturday, 30 feet in front of Llewellyn were rows and rows of chairs. O’Rourke was about to be introduced, but the candidate wanted to practice the pronunciation of Alvarez’s first name. O’Rourke often livestreams his movements during the campaign, as he did while driving from Corpus Christi to McAllen on Saturday. Normally O’Rourke drives himself, but Kennedy took the wheel this time, and would again later in the day on the way to Harlingen. On Friday in Houston, Cruz poked at Kennedy campaigning with O’Rourke. The crowd laughed at the reference to the 1969 incident at Chappaquiddick, where Sen. Ted Kennedy — great uncle to the congressman — crashed a car off a bridge. The passenger, Mary Jo Kopechne, was killed. O’Rourke responded to Cruz, though not by name, on stage, too. When Kennedy was driving his own wife, Lauren, as well as O’Rourke and his wife, Amy, to McAllen on Saturday, the livestream was running. 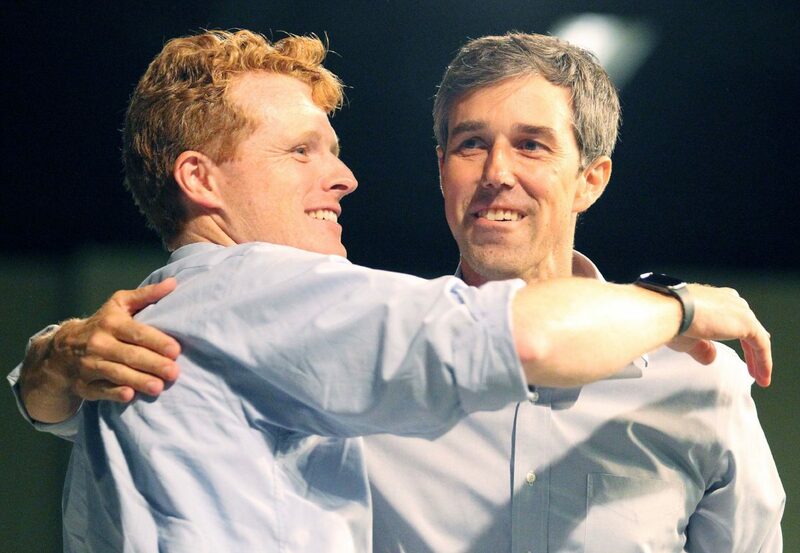 Kennedy, a fluent Spanish speaker, flipped between English and Spanish during his introduction, as O’Rourke regularly does. Kennedy critiqued Cruz’s filibuster that helped lead to a 2013 government shutdown, which O’Rourke followed up on when he had the microphone. But a sizable portion of O’Rourke’s speech focused on immigration and border security, two of President Donald Trump’s top issues that Cruz has been forceful on, too. A border wall, he added, would be nonsense, something Cruz has mostly supported. O’Rourke, who will return to McAllen on Thursday for a CNN town hall, referenced other local issues, such as there being no Veterans Affairs hospital near McAllen, something he said a senator should put an emphasis on. Kennedy, for his part, understands the region more than other members of congress far from the border. He was in Pharr within the last couple years for the opening of Kennedy Middle School, and in 2008 with his uncle, former U.S. Sen. Ted Kennedy, campaigning for then-nominee Barack Obama. The Valley has supported Kennedy too, and on Saturday large groups of supporters wore shirts that read “Viva Beto” on the front, and “Viva Kennedy” on the back. O’Rourke went a bit further.